Watch our tutorial video on the different features of the Contextual Menu. To access this menu in game, simply right click over any object in game. There are many different options to choose from and depending on the object, there may be different controls for that particular object. The top part of the contextual menu will always apply to that object. Everything under that first section applies to all objects. You can do pretty much anything in the Contextual Menu, with deck and dice options, tinting, saving to chest, scripting and much more. Depending on the object you right click on, the Contextual Menu may show different options. 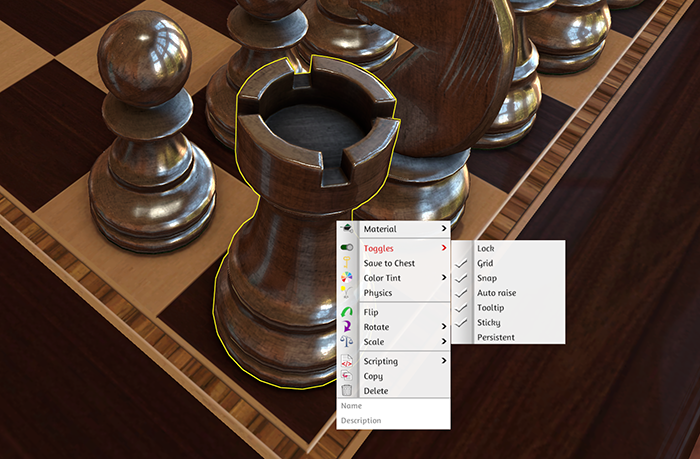 In the following image, this is a chess pawn that comes with Tabletop Simulator. In the Contextual Menu, you can change the material, save it to your Chest, tint the color of it, modify the physics, flip it over or rotate it, copy and delete it. You can also give the object a name and description. The “Name” field will show over the object as a tool tip. You can check/uncheck these per object. Lock: Locks or unlocks an object. (Hotkey is L). Grid: If you want this object to snap to any grid points, you would check this. Snap: If you want this object to snap to any snap points, you would check this. Auto Raise: By default this is on, so if you don’t need an object to auto raise, you can uncheck this. Tooltip: You can toggle off tooltips for any object if you need them to be hidden. Sticky: When picked up, objects above this one, will be attached to it. Persistent: Check this if you want this object to stay on the table when you switch to another game. The Global Contextual Menu has extra functions that can be used without clicking on a particular object. Camera Mode: This switches between 3rd and 1st person. The hotkey for this is P.
Load/Save Camera: You are able to save specific camera positions so you can easily switch between different positions at any time. Number slots that are taken will be black. Save Camera: Move your camera where you want and then choose a number from the Save Camera list. You can also easily save by using ALT + a number. Load Camera: To switch between saved camera slots, you can use the global contextual menu or use Ctrl + a number. 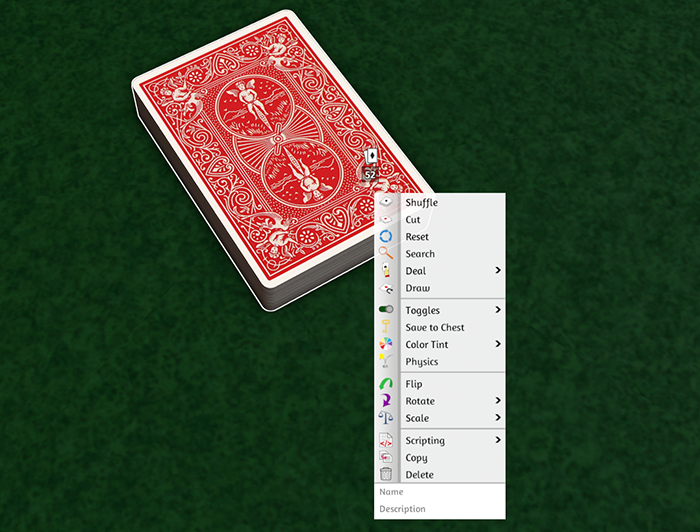 Blindfold: To make your view of the table hidden, choose this option. The hotkey for this is B.